Here is the first and last paragraph of an in depth review of Circling The Core recently written on his blog by Christopher James. Here are three excerpts from a recent review of the book by John Mackay which has recently appeared in Dream Catcher. Below it are extracts from a few of the many other reviews. The ones included here are by Martyn Crucefix, Penelope Shuttle, John Killick and Fiona Sinclair. The emotional core of the volume itself is located in two key poems: first, in ‘Journey’, where the notion of an unknowable essence is relocated to an urban environment, and ‘the rows of steel kisses/sealing the entrances to Underground stations’. In ‘Nothing’, the terrifying ‘void’ at the heart of the poem echoes Larkin’s nightmarish vision of ‘the sure extinction that we travel to’, and then returns us by implication to Thomas’ ‘The Glory’, and his question, ‘How dreary-swift, with naught to travel to,/Is Time?’ The questions that Schneider poses are no less potent, and explored in a way that her readers have become accustomed to – with a depth and intensity that make ‘Circling the Core’ her most richly textured volume to date. The book opens with a marvellous response to a Barbara Hepworth sculpture which, after tracing the curves and lines of the material reality, worms its way to a centre, a still point, "jewel, kernel, womb, unshielded self, / a promise of continuance. / We lay hands on profound silence." 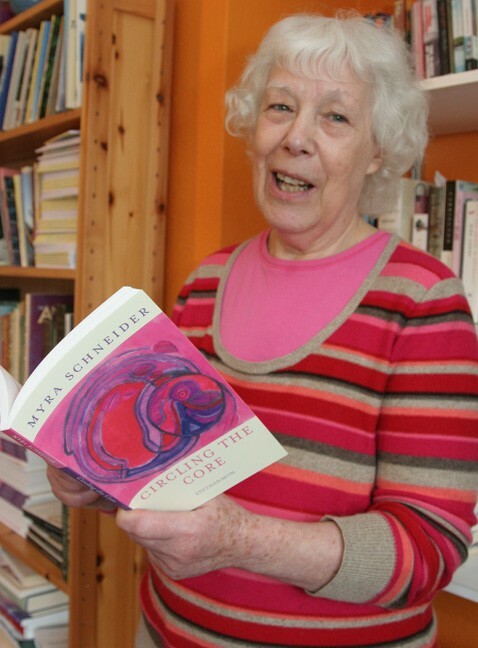 Those who have read her poetry in the past will recognise features of locality such as Pymmes Brook, the Piccadilly line viaduct to Arnos Grove, Arnos Park itself in north London and Schneider’s south-facing garden overlooking it. She has worked this landscape into almost mythic significance, its details able to reflect and evoke the inner experiences with which she is really concerned as in ‘Seeing the Kingfisher’, the ‘Drought’ sequence and ‘Skywards’. A little more exotically, ‘The Oyster Shell’ explores again this poet’s characteristic movement inward, a movement for which "prayer" offers no help but which, pursued with the kind of vigorous honesty that fills this book, can reach an almost Blakean intensity. 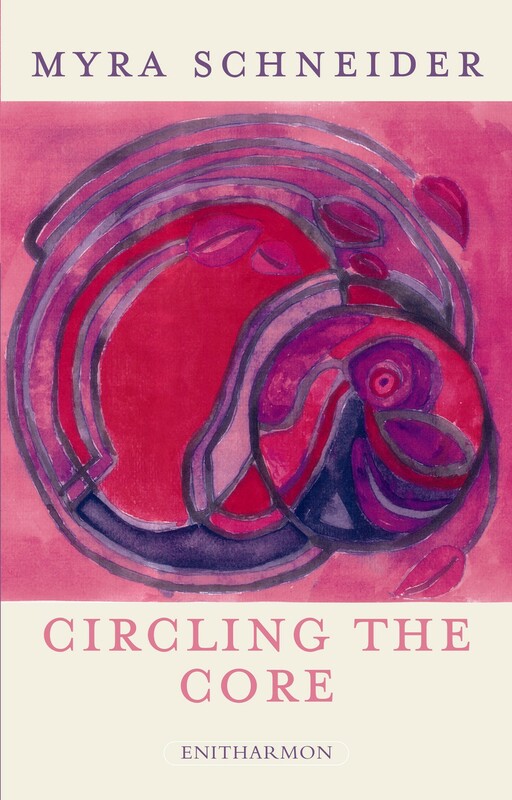 Many of the poems in Myra Schneider’s collection Circling the Core are meditations. Her great achievement here is to allow her female personas to find amongst their domestic world of cooking, kitchens and gardens the inspiration for meaningful deliberation. Although such poems focus on personal contemplation Schneider employs her considerable technical skill to draw the reader into these reveries. The ‘I’ may well be isolated in a pantry or before a mirror in her bedroom but the poet’s use of a conversational style packed with detail creates an intimacy between persona and reader. At the heart of these reflections lies a metaphysical desire for the speaker to capture eternity in the face of a fragile and unpredictable world. In many poems Schneider introduces hints of danger often in traditionally safe places such as home or a natural setting. This has a powerful effect on the reader suggesting that no where is quite as safe as it seems. … Myra Schneider searches deeply and without compromise for the fullest expression of life's possibilities. She enters the daunting yet essential regions where we face ordeals and seek understanding in and of the toughtest places in the world, both private and public. The associative magics and essential realities to be found in Circling The Core attest to this writer's fidelity to the 'unpredicatble power of human imagination,' the imagination which orders the world into being, knowledge and value. Myra Schneider has become an essential poet. Nobody else manages her fusion of the domestic and the global as well. Nobody else manages her fusion of the sensual and the spiritual as well. And in this, her ninth full-length collection, the amalgam is headier than ever before. Take Paula's Bowl for instance, one of a series of poems inspired by household objects. The ostensible subject is a large handmade item, which is described with Schneider's usual flair for indicating colour and texture: terracotta children in bell skirts are dancing / round a maypole. Blue florets speckle the long white dress / of a figure sitting on the ground, candleholders flower / on her head, hands, outstretched feet. A finger-thin dog / sniffs at a mottled triangular plate. But the real subject of the poem is Paula, Schneider's mother-in-law, the bowl's maker, and her life is recounted --- one of promise unrealised, because of the rise of Nazism in Vienna, her flight to London, and lack of artistic success in the new environment. This is summed up in the lines which end the poem: every time I take bread from her bowl I remember / what was given, what was snatched out of her reach. This poem is typical of Schneider's work in its concentration on evoking scenes and objects, in its storytelling, and in its warm humanity. Not the least of its virtues is its accessibility to the ordinary reader. There are poems, however, where the poet reaches out for a meaning less rooted in the commonplace. Naming It is one of these. Nothing at the outset here is comfortable or secure. We could be in a dream/nightmare set in a city/landscape, but even that is too specific. Everything is broken, seems to have been destroyed in some cataclysm. The emotional atmosphere is summed up in the words The panic is all in the rubble. Then suddenly the poet focuses on the microcosm: a pool of taintless blue which is so small / I could hold out my hands and cup it.' It becomes terribly important to name this object. This is a primitive urge, as a stay against despair and dissolution. The culmination of the poem is this last stanza: I stop at harebell trembling on its wiry thread, / harebell that bends and keeps its head. / Babbling its name, I surface in another reality. This uncomfortable vision ends in at least a temporary reprieve. There is variety here, and amongst the book's many delights are the title sequence inspired by Hepworth sculptures, a lively narrative set in a country hotel, and an idiosyncratic re-telling of the Orpheus myth in the voice of Eurydice. Circling the Core is Schneider' is most coherent and consistently rewarding collection. cloud and sun, roared its energy into my ears. by city, smell of hay and are rarely mowed. and utter warnings that day is paling out. who knows what could sprout, run wild? but shied away from. What she couldn't mould was her own life. of her sharp disappointment that little of her work sold. what was given, what was snatched out of her reach. on my heart, trapped by fingers taking the pulse. uncooped sea, colour, or being alone? or words and the silent webs they're hung in? other lives are part of a new creation.